A newfound comet is heading for a brush with the sun, one whichit will likely not survive. 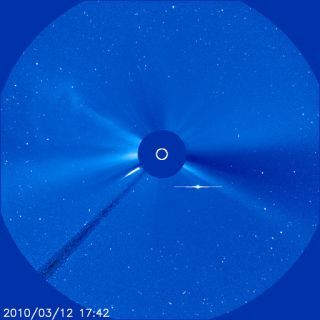 The sun-grazing comet is flying too close to the sun to bevisible to the unaided eye, but it shows up clear as day in new sun photos takenby the Solar and Heliospheric Observatory (SOHO), according to the websiteSpaceWeather.com, which reported the find Friday. Comets that make close passes by the sun are not uncommon. Astronomers estimate there to be more than 1,600 such icywanderers making periodic passes through the heart of the solar system. That sun-grazingcomet count hit the 1,000-mark in 2005. The comet currently headed for the sun may be part of theso-called Kreutz group of comets, which are known for having orbits that bringthem within a few hundred thousand miles of the sun. All Kreutz cometsare thought to be the remains of one giant comet that broke apart severalcenturies ago. They are named after 19th century astronomer Heinrich Kreutz,who first demonstrated that such comets were related. SOHO is a joint mission by NASA and the European SpaceAgency. The observatory can see comets as they draw close to the sun because ituses a central disk to block the star?s glare in order to see solar weather andother objects nearby. The SOHOphotos have been instrumental in finding sun grazing comets since it wasfirst began observing the sun in 1995. Before SOHO launched, only 16 sun-grazing comets had beenspotted by space-based telescopes, NASA officials have said.